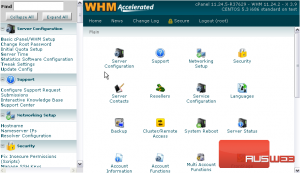 Many of the features that can be assigned to a cPanel account are stored by WHM in Feature Lists, which allow you to enable or disable whatever features you want. 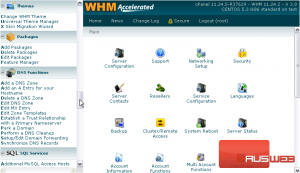 Once created, a list can be assigned to a Package and then chosen when creating a cPanel account. 1) To manage feature lists, go to Packages. 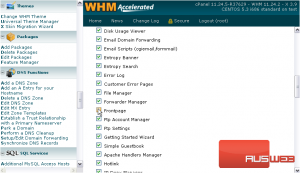 2) Then click Feature Manager. The special feature lists always apply to all users. If you disable a feature in the “default” feature list, it will be disabled in every user’s cPanel unless another feature list grants them the feature. 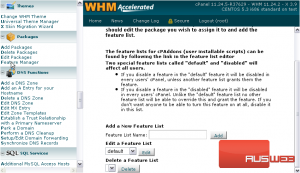 Disabling a feature in the “disabled” feature list will also disable it in every user’s cPanel, but no other feature list will be able to override this and grant the feature. If you don’t want anyone to be able to turn this feature on at all, disable it in this list. As described on this page, there are two special lists available here — default and disabled. You can also create your own lists here. 3) To edit a Feature List, click the Edit button. We’ll edit the default list. You may disable or leave enabled whichever features here you want. For demonstration purposes, we’ll disable a few. 5) And, let’s disable Frontpage. 6) Scroll through the rest of the options, turning off whatever you want. 7) When ready, click Save. The default feature list has been saved. As of right now, no account will be able to use phpBB2 or Frontpage, but we could still enable them in a custom feature list. 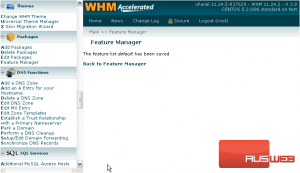 8) Click Back to Feature Manager. 9) Now, let’s disable the same features in the disabled list. Proceed in the same manner as before, this time choosing the disabled list.